About the Shashti Mahotsava (Annual Car Festival) and the Brahmaratha: Of the many festivals in the Temple, the annual Car festival which falls on the sixth day of the bright half of the month of “Margshirsha” (November / December) is the most important. The day is known in popular parlance as the “Manjeshwar Shashti” and coincides with “Skhanda Shashti” in other parts of South India. On that day, the six – wheeled chariot called “Brahma Ratha” is pulled along the Car Street so-called from its use, by thousands of votaries coming from far and near. The “Ratha” has a base 17 feet square, a height of 17 feet in raw and a maximum girth of 53 feet. But when decked for the occasion with all its decorative appurtenances, it rises to a height of 71 feet, and affords an unforgettable experience of solemnity and grandeur as it moves amidst a soothing mass of human heads. The Ratha was built in 1834 A.D. 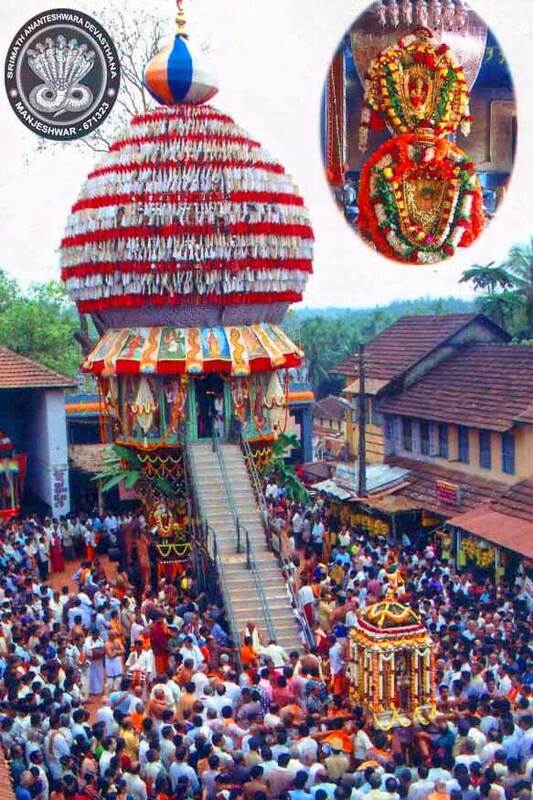 The Brahma Rath viz the Lords Chariot attracts the attention of the devotees who throng the precincts of the Temple at Manjeshwar during the annual Shashti festival. Ever since man discovered the wheel in his flight of imagination he has strived to construct some moving vehicle of gigantic proportions. The Sun-God astride his one wheeled chariot drawn by seven horses roaming the skies in one such examples of mankinds imagination. The writing of the past Yugas viz Kritha Yuga, Trethra Yuga, and the Dwapara Yuga have ample illustrations of the use of chariots, besides the later puranic scriptures relating to Ramayana and Mahabharata extol the use of the chariots. The excavation at the sites of ancient civilizations at Harappa and Mohenjadaro, toys as well as parts of the chariot have brought to light to use of the chariot in those times. This was about 5000 years before the birth of Christ. The art of construction of the chariot has been abundantly written and explained in the ancient writings like Manas Sara, Shilparatnaka, Rudra Vaastu, Parasar Vaastu and other scriptures. These ancient writings have dealt at length on the use of chariots at war by Kshatriya Claus and the chariots used at the Temple festivals. Sri Madanantheshwar Temple is one of the most ancient Temple in the South Kanara District. (The Gowda Saraswat members of the community who fled Goa under the Portuguese rule, which witnessed a reign of terror and forced conversion to Christianity, has settled down in the coastal districts of South Kanara, Malabar, and at Cochin in Kerala state. Prior to mass exodus of the Gowda Saraswats from Goa, this trading community had trade establishments all along the west coast and were also said to have carried on trade with the Gulf countries, Western Europe and the West Indies. Manjeshwar was one of such places where Gowda Saraswats had settled down with close trade relations with other countries as they had made trade establishments long ago. The History of Manjeshwar also mentions that in the year 1799 A.D. the king of Vittal, a kingdom bordering Manjeshwar looted the Temple, destroyed the chariot and took away all the valuables including the deity’s jewellery. With normalcy slowly returning to this area, the members of the Gowda Saraswat community presented a petition to the head of the Kashi Mutt Sri Sri Vibhudendra Teerth Swamiji, who after visiting Manjeshwar made arrangements for the repair of the Temple, and restoration of daily pooja and other rituals. The work of repair etc. at the Temple was completed in the year 1804 and a detailed procedure of Trikala pooja and other religious rituals were laid down. The completion of the Brahma Rath in the year 1834 marks the beginning of the celebration of yearly chariot (Car) festival with great enthusiasm by the devotees. The present chariot is the same Brahma Rath, the encouragement and patronage bestowed by the Kashimatadeesh Sri Sri Vibhudendra Teerth Swamiji and stands as a mute evidence of the greatness of the Swamiji. The puranic writings in the Vishnu Dharmotthara Purana (which forms a part of one of 18 puranas as given below) describe in detail the type of wood and the manner in which the Brahma Rath is to be constructed. 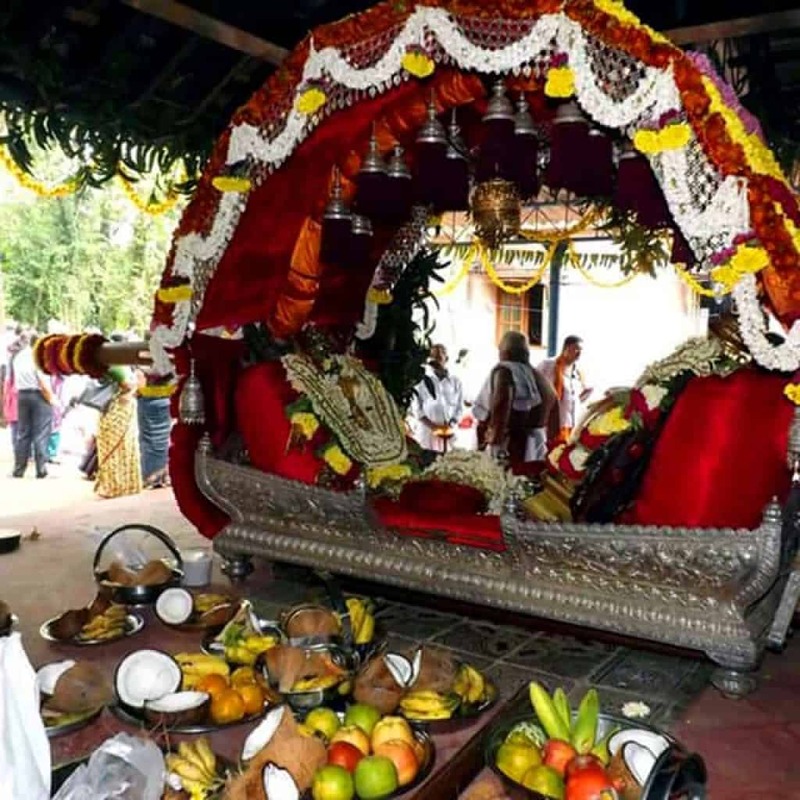 The Brahma Rath of Manjeshwar Temple has been constructed according to these specifications and a matter of great pride to the Gowda Saraswat Community. 1 Vishnu Purana 23000 Lord Vishnu Stories of various devotees, a description of varnasrama, the six angas of the Veda, a description of the age of Kali, description of Sveta-Varaha Kalpa, Vishnu dharmotara. 2 Naradiya Purana 25000 Lord Vishnu This Purana contains a synopsis of everything; it describes Jagannatha Puri, Dwaraka, Badrinatha, etc. 3 Padma Purana 55000 Lord Vishnu Contains the glory of Srimad-Bhagavatam, the stories of Rama, Jagannatha, Matsya, Ekadasi, Bhrgu, etc. 4 Garuda Purana 19000 Lord Vishnu Subject of Bhagavad-gita, reincarnation, visnu-sahasra-nama, description of Tarsya Kalpa. 5 Varaha Purana 24000 Lord Vishnu Describes different vratas, Lord Vishnu’s glories. 7 Brahmanda Purana 12000 Lord Brahma Describes the vedangas, describes the Adi Kalpa. 8 Brahmavaivarta Purana 18000 Lord Brahma Contains the glories and pastimes of Radha and Krishna. 9 Markandeya Purana 9000 Lord Brahma Stories of Rama and Krishna. 10 Bhavishya Purana 14500 Lord Brahma Contains the glories of devotional service, prediction of Lord Chaitanya. 11 Vamana Purana 10000 Lord Brahma Contains the story of Lord Trivikrama. 13 Matsya Purana 14000 Lord Shiva Temple construction, describes Vamana and Varaha Kalpas. 14 Kurma Purana 17000 Lord Shiva Contains the conversation between Krishna and the Sun-god (mentioned in Bhagavad-gita), Danvantari, Describes the Lakshmi Kalpa. 15 Linga Purana 10000 Lord Shiva Contains the glory of Lord Nrismhadeva, Janardhana, the story of Ambarisa, the glories of Gayatri. 18 Agni Purana 15400 Lord Shiva Contains the description of Salagrama, Describes the Isana Kalpa. The puranic writings mentioned above lays down that the wood for the construction of the Rath must come from trees like Krithmalai, Saal, Jambaka, Saara, Sarala. Arjuna, Kadira etc. The required trees, the direstion in which the tree stands and to be found, is either communicated to the person/persons by divine indication either in the form of a dream or by the divine oracle through DEVADARSHAN and the Temple records state that these indications were duly obtained as mentioned above. It is specified the tree identified from which the Rath is to be constructed should exhibit the divine signs/symbols like Lord Vishnus Chakra, Counch the sign OM etc. The chariot of Lord Jagannath of Puri is constructed on similar lines. It is also necessary that the tree considered fit for construction should not have dried branches, nest of birds, nor the snakes should dwell under its roots. The trunk of the tree shall be solid without any defects like cavities etc. The party, which goes in search of such a tree, should be met with good omens, which conclusively point to the desired tree. The search party then offers prayer to the tree at an auspicious time, reciting their desire to use the tree for the construction of the chariot, and offer prayers to the spirits which dwell on the tree to vacate the tree, and then with an axe smeared with honey and ghee falls only in a northerly or easterly direction. 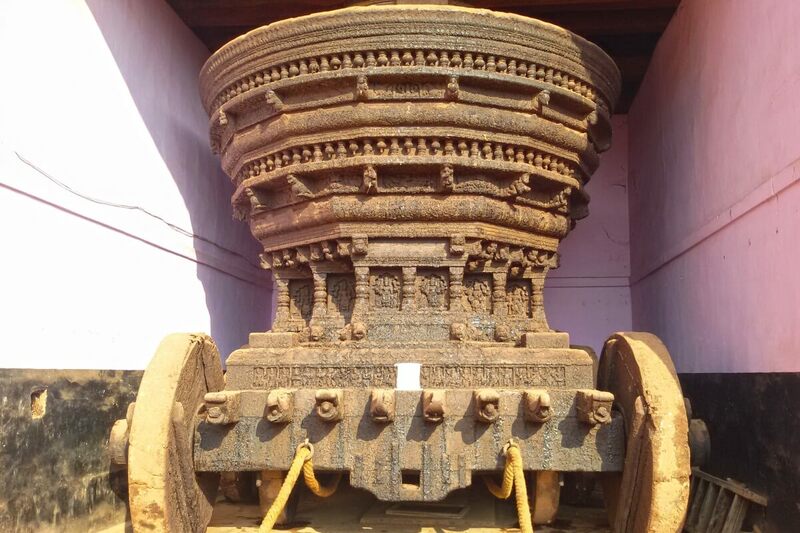 It is to be noted that chariot of Manjeshwar Temple was constructed strictly on the lines stated above. If we consider the conditions available at the time of the construction viz about a century and a half ago, in the face of absence of present facilities of rail or lorry, advanced engineering equipments etc. the feat of construction of the Rath is a miraculous feat by the early inhabitants. A look at the gigantic Brahma Rath would certainly bring one to the realization of the super human feat. The writings in the Vishnu Dharmotthara explain the shape of the chariot, the figures which should adorn the outer periphery, the number of wheels required and the details of the chariot. The present chariot of the Temple is a explicit example of the details given in these puranic writings. All the carved idols have identical faces, except the face of Lord Narasimha has the face of a lion and the idol faces the south; above all these figures, carvings of creepers, Lord Vishnu in the posture of Sheshashayanam and Nandi, the vehicle of Lord Shiva performing aarti to Lord Shiva and other rare carvings have been made. 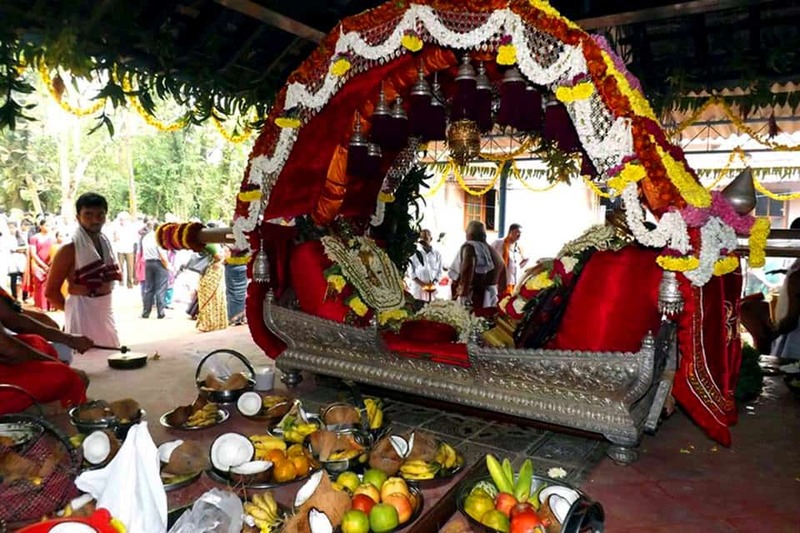 During the festival the chariot is decorated on the lines followed in the other parts of Dakshina Kannada district. Across the cultural four pillars, crossbeams are tied to which circular bamboo strip is tied. Above the main structure, wooden planks are placed in Jalandhar fashion, and to this wooden strips are tied bringing about a circular shape or kalasha and decorated with small cloth flags of red and white colour. The sides of the chariot and above are decorated with paintings of divine images. In the center of the chariot, a wooden platform is built on which the Lords throne is placed. Above the upper structure decorated with flags, a similar round structure enclosed with colourful cloth is constructed on which the Suvarna Kalasha (i.e a round vessel of golden emblem) is positioned. The completely decorated chariot stands 71 feet in height. Inside the chariot and around the Lords throne, about 50 to 60 persons can be accommodated. It is a custom at the Temple that the Ratharohan i.e. taking the Lords idol up into chariot must be completed before the sun sets. 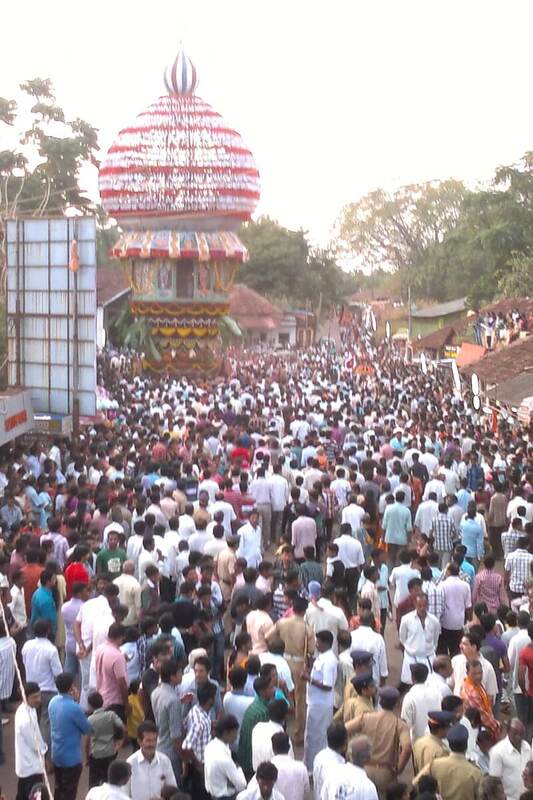 Accordingly the chariot festival takes place in the evening itself. This chariot festival is not only performed for Lord Vishnus Avtaar of Lord Narasimha, but also to Shesharoopi Lord Subramanya. 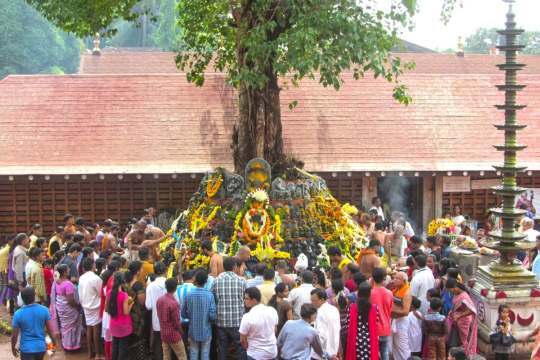 To the devotees who come to this sacred place of Manjeshwar to witness the Car festival, this is an unforgettable scene. The farsighted of Sri Sri Vibhudendra Theertha Swamiji who sculpted the entire idea of the chariot (Car) festival thought and implemented about 150 years ago could well be imagined. Around 1834 and there about with no rail link, primitive roads, absolute absence of modern transport facilities, hundreds of people used to come walking to Manjeshwar to participate the Car festival. This affirms ample witness to the dedication, devotion, enthusiasm and social awareness of the Gowda Saraswat community and people in general of this large district. It also indicates the deep devotion to God, and the devotion to the revered Guru, by the common people and it is a fervent prayer of the present management of the Temple that such devotion, enthusiasm and broad mindedness be bestowed on the entire Gowda Saraswat community by Lord Bhadra Narasimha, Lord Anantheshwar and revered Swamijis of the three Mutts.